We know how important it is for young people to take root in a rich and stimulating landscape where they can thrive. Increasing the opportunities for personal achievement, inside and outside the classroom, is the goal of One Campus Plus. As we prepare to launch the One Campus Plus campaign, we invite you to be part of our next generation of givers and help us to ensure that the Project we have begun, is guaranteed to be the very best it can be. 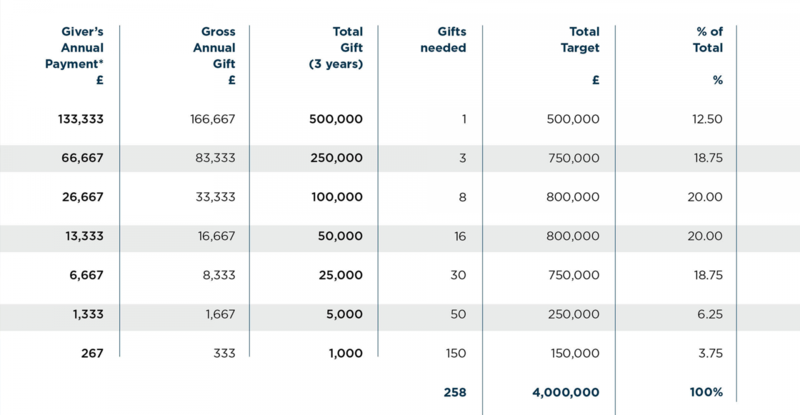 The Scale of Giving below shows an example of gifts in cash and pledges that can be made over three years to raise the £4 million. All gifts will be gratefully received. Gifts can be made above, below and in between the various levels and can be pledged over any frequency and any period between one and three years. 1.Net donation amount for a donor paying adequate UK income tax and who signs a valid Gift Aid declaration. 2.Total value of donation to the school once Gift Aid has been reclaimed. 3.Net cost to a 40% UK income tax payer after reclaiming additional tax relief as a charitable donation in their tax return. This is the responsibility of the individual donor. 4.Net cost to a 45% UK income tax payer after reclaiming additional tax relief as a charitable donation in their tax return. This is the responsibility of the individual donor. email campaign@Warwickschools.co.uk or call 01926 776402. Gifts from corporations or foundations/trusts may also be eligible for tax relief as a charitable donations. Disclaimer: These figures are presented for illustrative purposes only. No tax advice is being given. All donors are encouraged to obtain qualified financial advice to confirm the tax implications of their gift, as personal circumstances will vary.